So for about the 100th time in the 10 years since leaving school I have just finished moving again. One day I would like to settle into my own house and stop moving but until then I will enjoy what I can. Thankfully we have moved into a house with enough space for a craft room.... unfortunately it still looks roughly like this! Of course it won't stay like that but I kinda have to focus on trying to get some uni work finished at some point very soon. My mid semester exams are all finished and my group assignments are due in the next couple of weeks. Because of uni ramping up craft has taken a bit of a sideline. I sneak in a project or two mainly to keep myself sane but it often only gets a couple of stitches done. 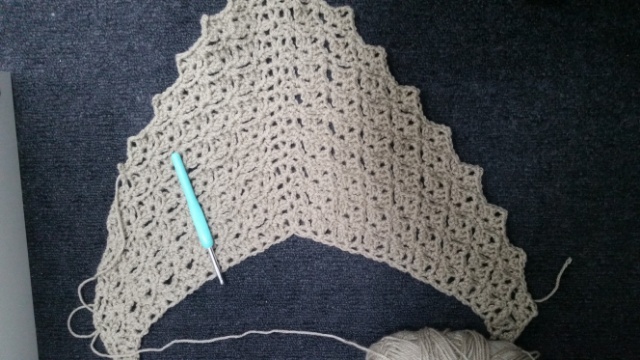 That said I am constantly carrying around this lovely shawl in my bag and I work on it when I can. Mainly a little bit at lunch and when I'm waiting for stuff to happen. It's going to be beautiful when finished and I'm going to enjoy wearing it next winter as we don't have much of this year left to wear it in!! It's the cascade clusters shawl by planet june. I will share more information when I have it finished. Just before moving I visited Lincraft for a little treat and to get some supplies for upcoming projects. The fabric on the left is to make a giraffe for a friend. Her daughter and son fight over the one I gave him so I'm making another for her. The green cakes are for another rainbow ripple blanket for another friend's baby. Being roughly what I'd call a 10ply yarn or worsted weight (depending what system you use) it is working up really quickly considering the lack of time I've spent on this so far. It is my pick up and do in the evening when I have 5 minutes spare before falling asleep project. With all the moving I have been collapsing to sleep really early. 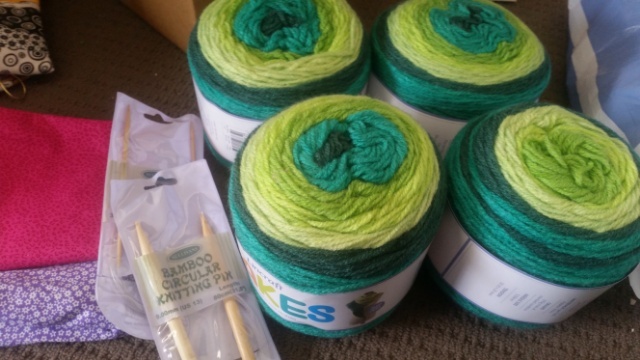 My friend picked out the cake out of a selection I showed her but I'm also glad that I like working with this yarn. I also have another baby blanket I should be working on but it just requires too much thought at this point. After my assignments are finished I should have time again and thoughts. We shall see!! 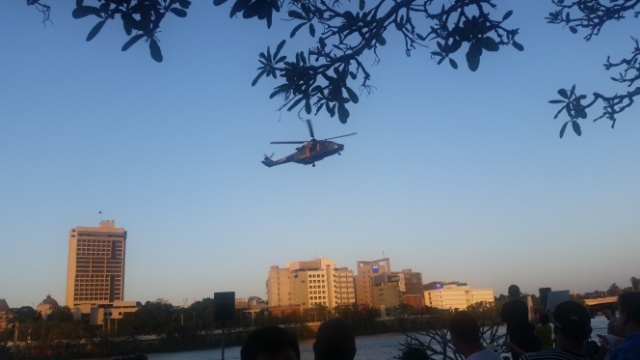 Last weekend we escaped the crazy and I took the kids into see riverfire. It's a firework display in my city where they have barges in the river and also points on the buildings. We were there from mid afternoon and had our spot saved a couple of hours before the fireworks started. It gets really crowded but at least they have some entertainment before hand. They had army helicopters doing manoeuvres and the jets come through and even a C-17 fly over. It makes it more enjoyable to wait. I will leave you now with my stories from this month. Hopefully next month will feel a lot more settled and I might be able to actually achieve something. I dream of a craft room in my new house, but I got the feeling it's going to end up being a "craft closet"! 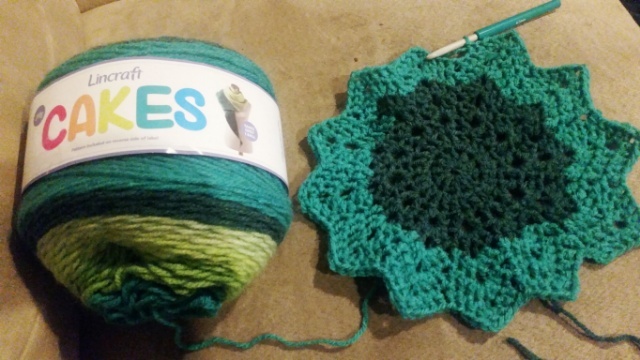 Oh those green cakes of yarn look great and I can't wait to see it all stitched up. Hope you get settled soon and get your work finished for school. 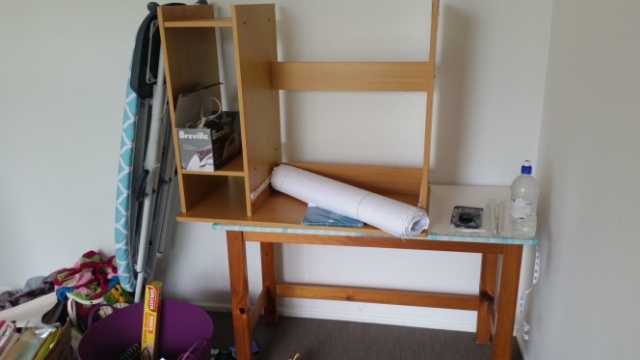 Then you can work on setting up the new craft room and get to crafting! Do you have a lot of time left for school? I hate moving! I have done it once since 1987 and swear never again! The fireworks sound fun and a craft room sounds wonderful.